Brigget Barrios is an associate in the Sacramento office of Lewis Brisbois and a member of the Workers' Compensation Practice. She attended the University of Arizona, where she graduated a year early with a Bachelor of Arts degree in Political Science and a Minor in Spanish. While in college, she was a member of the Phi Delta Phi Legal Honor Society, she interned for a U.S. Senator, and she studied abroad in Spain. She obtained her Juris Doctor from McGeorge School of Law in 2014, with Concentrations in both Tax and Business Law. 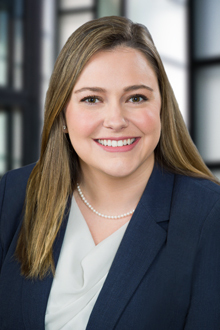 She has over five years of experience as a law clerk and associate attorney for both applicant and defense Workers' Compensation firms, most recently serving as in-house counsel for a government agency. Brigget's family operates a fourth-generation farm in Yolo County, so she is passionate about representing employers. She enjoys spending time with her husband, son, and dog, as well as reading, attending trivia, and golfing.